One of my favourite landscape photography tips for beginners is very simple – wait and see what happens. I love seascape photography because locations seem different every time I return due to tides, time of year, light, wind and weather. In Ireland, there can literally be 4 seasons in a day, if not an hour. This makes for some exciting photography and you literally never know what you might get each time you leave the house. Work and family commitments can leave time for photography at a precious minimum. When everything falls into place with the weather, it can be very exciting to land at a location and find very changeable conditions. This is usually a great sign of a promising shoot. 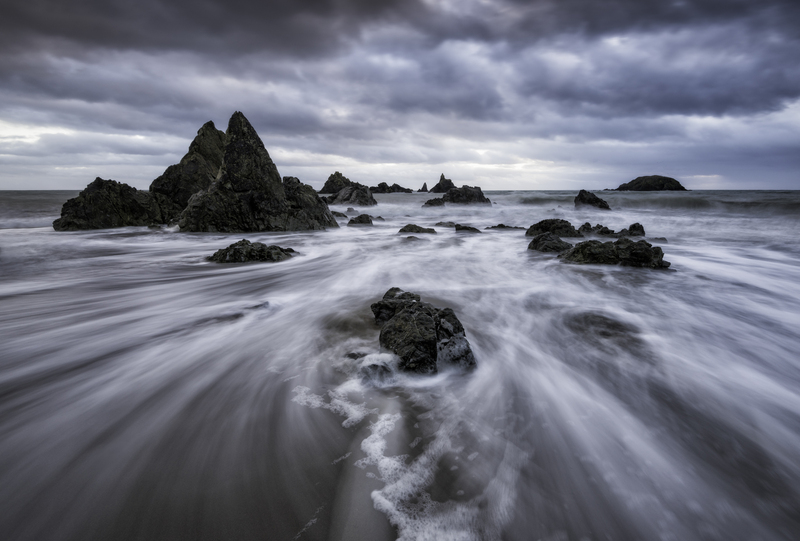 This is what happened my at a recent landscape shoot at the Copper Coast in Irelands south coast. Within 20 minutes, the light had given a wonderful display allowing me to capture several photos I was happy with. It had been a warm evening. Broken cloud cover and light winds created a beautiful wash on the sand as the waves rolled in. I’d of happily gone home with what I had on the memory card. However, as usual, I hung around that little bit longer to see what might develop for 30 minutes or so. Clouds grew thicker and thicker until I could not resist taking out the camera again to try and capture something different if not moodier. Dramatic waves and clouds helped me craft a darker moodier image just to my liking. It is amazing how different this image is to those two previous shots. These are the images I believe last the test of time longer than the bright vibrant sunsets & sunrises. So next time you are out for a shoot and think you have some great images in the bag, just wait around a little longer and see what happens….